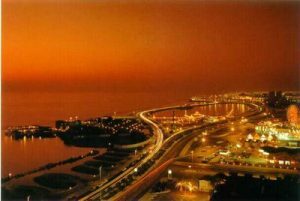 Saudi Arabia Destination in Saudi Arabia from Take A Break Holidays. Saudi Arabia In cities such as Mecca, Riyadh, Jeddah, Najran, Yanbu, Minhal,Taif plus many more. 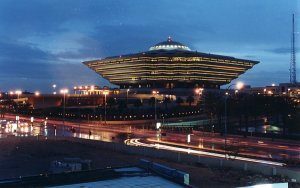 Accommodation list of Hotels Apartments and resorts in Riyadh. Accommodation ist of just over 100 Hotels Apartments and in Mecca. 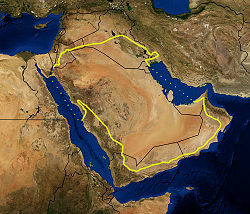 Saudi Arabia occupies about 80% of the Arabian peninsula,lying between latitudes 16° and 33° N, and longitudes 34° and 56° E. Because the country’s southern borders with the United Arab Emirates and Oman are not precisely defined or marked, the exact size of the country remains unknown. The CIA World Factbook’s estimate is 2,250,000 km2 (868,730 sq mi) and lists Saudi Arabia as the world’s 13th largest state. Saudi Arabia’s geography is dominated by the Arabian Desert and associated semi-desert and shrubland (see satellite image to the left). It is, in fact, a number of linked deserts and includes the 647,500 km2 (250,001 sq mi) Rub’ al Khali (“Empty Quarter”) in the southern part of the country, the world’s largest contiguous sand desert. There are virtually no rivers or lakes in the country, but wadis are numerous. The few fertile areas are to be found in the alluvial deposits in wadis, basins, and oases. The main topographical feature is the central plateau which rises abruptly from the Red Sea and gradually descends into the Nejd and toward the Persian Gulf. On the Red Sea coast, there is a narrow coastal plain, known as the Tihamah parallel to which runs an imposing escarpment. The southwest province of Asir is mountainous, and contains the 3,133 m (10,279 ft) Mount Sawda, which is the highest point in the country. Except for the southwestern province of Asir, Saudi Arabia has a desert climate with extremely high day-time temperatures and a sharp temperature drop at night. Average summer temperatures are around 113 °F (45 °C), but can be as high as 129 °F (54 °C). In the winter the temperature rarely drops below 32 °F (0 °C). In the spring and autumn the heat is temperate, temperatures average around 84 °F (29 °C). Annual rainfall is extremely low. The Asir region differs in that it is influenced by the Indian Ocean monsoons, usually occurring between October and March. An average of 300 mm (12 in) of rainfall occurs during this period, that is about 60% of the annual precipitation. Animal life includes wolves, hyenas, mongooses, baboons, hares, sand rats, and jerboas. Larger animals such as gazelles, oryx, and leopards were relatively numerous until the 1950s, when hunting from motor vehicles reduced these animals almost to extinction. Birds include falcons (which are caught and trained for hunting), eagles, hawks, vultures, sand grouse and bulbuls. There are several species of snakes, many of which are venomous, and numerous types of lizards. There is a wide variety of marine life in the Persian Gulf. Domesticated animals include camels, sheep, goats, donkeys, and chickens. Reflecting the country’s desert conditions, Saudi Arabia’s plant life mostly consists of small herbs and shrubs requiring little water. There are a few small areas of grass and trees in southern Asir. The date palm (Phoenix dactylifera) is widespread. Take A Break Holidays takeabreakholidays, Saudi Arabia Accommodation.